This unique portrait shows a bearded black man who has assumed a powerful pose, his hand resting on the hilt of his sword while he gazes out of the picture. He is dressed quite soberly, in a Flemish cap, doublet, shirt, tabard and hose. More luxurious items are the white kid gloves, the pouch decorated with a fleur de lis and the sword. The man’s pose, clothing and attributes indicate that the subject of this portrait is a soldier. 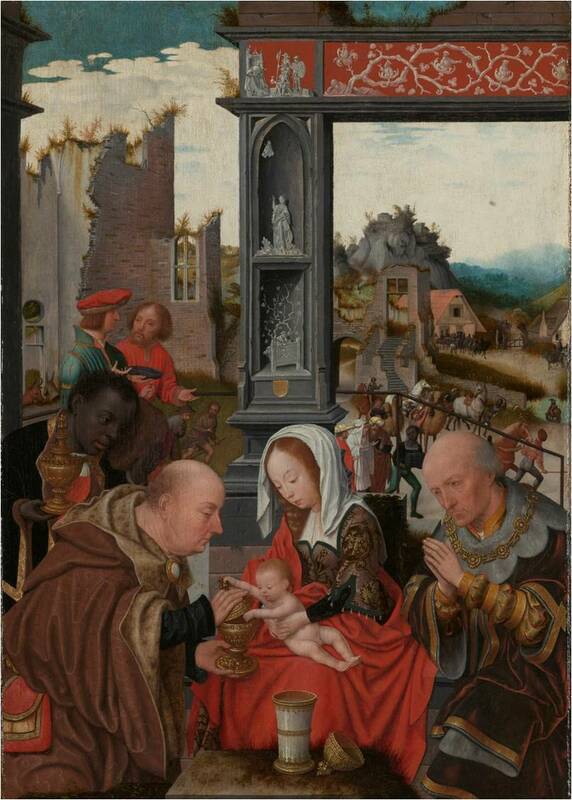 The painter of this work has been identified by Jan Piet Filedt Kok with reasonable certainty as Jan Mostaert. As far as is known this is the only painted portrait of a black man from the early sixteenth century. 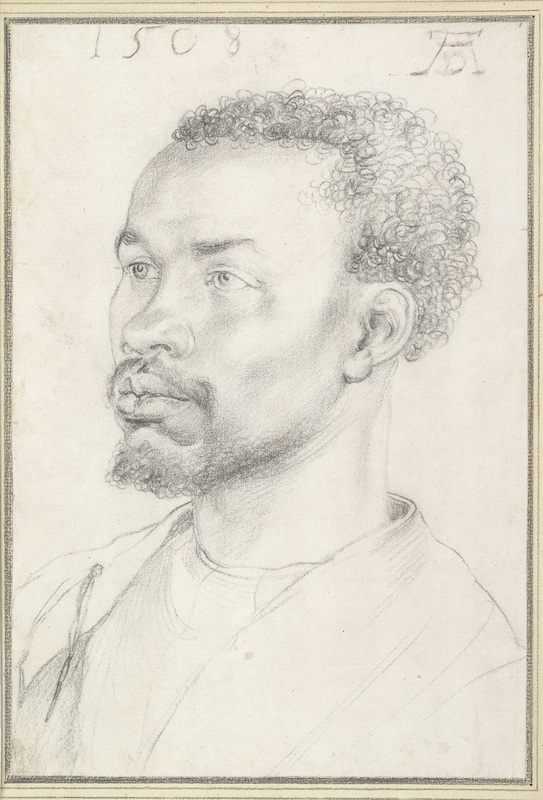 Around the same time, in 1521, Dürer drew a portrait of a black woman, Katharina, in Antwerp; in 1508 he had also drawn a portrait of a black man who coincidentally seems to bear some likeness to the man in Mostaert’s painting. 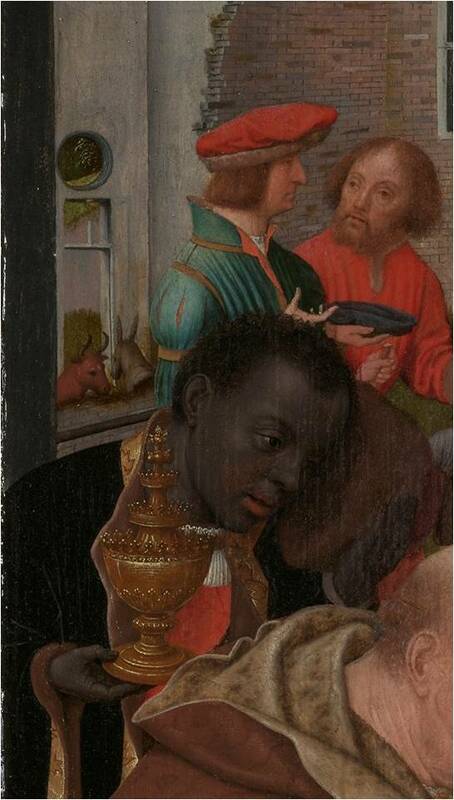 This black man is not the only African character to appear in Mostaert’s pictures. In other works he also painted a Black King, a servant in the background and several musicians. But these are rather stereotypical representations of subsidiary figures which are hardly based on life. The identity of Mostaert’s patron is unknown, however: it may have been the man depicted in the portrait, although this is not necessarily the case. Recent attempts to discover the identity of the man portrayed in this painting did not prove an easy task. Only the historian Ernst van de Boogaart found a possible candidate, Christoph le More from the court of Emperor Charles V 1500 –1558. This identification is not certain, however, for there are other possibilities. Mostaert may have received the commission at the court of the powerful Margaret of Austria in Malines 1480 –1530, where important Europeans constantly came and went. The Haarlem painter was certainly in Flanders around 1521 and was received by Margaret in Malines. Margaret also maintained contacts with Charles V, François I of France, Henry VIII of England, the powerful De Mendoza family from southern Spain and important Italian families such as the Medicis and the D’Estes. All included the emblem of the fleur de lis in their arms which also appears on the African man’s pouch. Most of these potentates also had blacks at their court. A black trumpeter retained by Henry VIII 1491 –1547 appears, for example on the Westminster Tournament Roll from 1511. The D’Este family, in particular Isabella d’Este 1474 –1539, also surrounded themselves with black people; around 1523 Isabella’s brother Alfonso d’Este 1505 –1534 commissioned the Italian painter Titian to produce a portrait of his wife Laura de’ Dianti with a black page. It has even been suggested that Alessandro de’ Medici 1510 –1537 may have had a black mother, as a posthumous portrait of him shows African features. Nevertheless, Mostaert could also have received the commission in Antwerp, the trading centre of Europe. His client might have been João Brandão, the king of Portugal’s agent between 1509 –1511 and 1520 –1525, whose black maid Katharina had already been drawn by Dürer in 1521. The major obstacle in endeavouring to identify the subject of Mostaert’s portrait is the fact that black people have ordinary European names in written documents and are seldom described as black. So Dürer and Mostaert’s pictures are important in that they show that blacks were already found in Flanders in the early sixteenth century. One element in the portrait that has been identified with certainty is the insignia on the man’s Flemish cap, which is associated with a place of pilgrimage, Halle in Belgium. This was the site of a pilgrimage church to which a Black Madonna had drawn pilgrims, including many European sovereigns, from far and wide since 1267. So the man in the portrait had probably been to Halle, possibly during a special procession of the Madonna’s statue.